Another NASCAR race, another NASCAR fight. Only weeks after getting jumped by Matt Kenseth in a major brawl at Charlotte, Brad Keselowski found himself some trouble again tonight, this time with Jeff Gordon. Keselowski and Gordon were racing hard with only two laps to go when Keselowski got a big run on Gordon when battling for second and got into Gordon, which led to Gordon cutting a tire and seeing his title hopes take a serious hit. 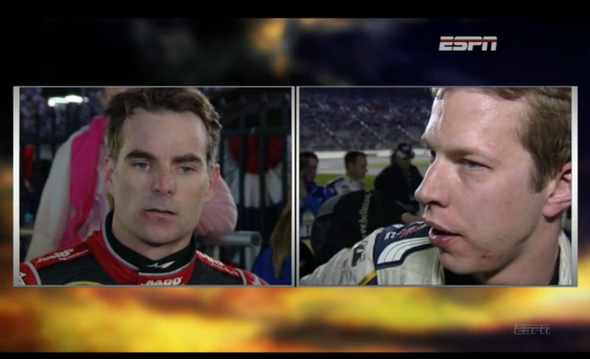 Then after the race, Gordon was none too pleased with Keselowski and a skirmish ensued. And then, Gordon used some colorful language to describe his adversary. As a NASCAR fan, I can't recall having as many fights in as short a stretch of a season in a while. Of course with this new championship format featuring the feared elimination, every driver is on the line. After all both Keselowski and Gordon are contending for a shot to run for a championship. In regards to the on-track issue, while Keselowski is certainly guilty of being too aggressive at times, I actually don't think he is at fault. Gordon didn't take a great line and Keselowski got a big run on him. I don't believe he was trying to wreck Gordon but of course, I can't blame Gordon for being frustrated seeing his day go up in smoke when he had the best car. That said, 'Bad Brad' isn't to blame. And oh by the way, Jimmie Johnson won the race for his first win of the season. Now that another eliminated driver has won a race after Dale Earnhardt, Jr. won last week, now at least three positions in the run for the Sprint Cup in two weeks at Homestead-Miami Speedway will be decided by points. Here are the updated standings with Gordon currently in fourth and only one point ahead of Kevin Harvick. Keselowski sits in seventh at only five points out. In other words, not much to look out for next week at Phoenix International Race, eh?